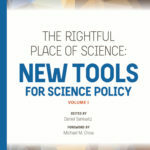 The newest volume in The Rightful Place of Science series, the first volume of New Tools for Science Policy, is now available from Amazon! Science and innovation have been at the core of America’s economic and political activity since at least the end of World War II. But much has changed over the past seventy years, and the design principles and policy tools that structure science and innovation systems in the United States must change along with it. 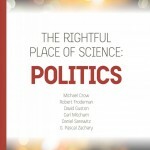 This book collects innovative methods and tools that can guide the design and operation of science policy as it meets the needs of a rapidly changing world. Representing two decades of work by scholars from and affiliated with the Consortium for Science, Policy & Outcomes, New Tools for Science Policy is a landmark work of science policy theory and practice. In a world where scientific research and technological innovation receive, on the whole, more than a trillion dollars of support from government and industry, the idea that the advance of knowledge and innovation can be understood separately from its political, institutional, cultural, and economic contexts is nonsense. Containing essays from the co-directors of CSPO, David Guston and Daniel Sarewitz, as well as by Michael Crow, ASU’s president and CSPO’s founder and chair, this volume explores those complex interactions from a range of illuminating perspectives. Can biofuels be a viable alternative to traditional fossil fuels? Will they help to address climate change? Can innovation bring about a new generation of efficient biofuels? 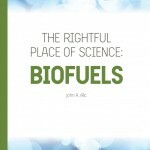 Eminent energy technology and policy thinker John A. Alic tackles these questions in this thoughtful and authoritative assessment of biofuels. Highlighting CSPO’s growing engagement with sustainability, energy justice, and the role of the Department of Defense in promoting energy transformations, this book is essential reading for anyone interested in the role of biofuels in the U.S. energy system. Innovation in the energy sector is necessary to maintain economic competitiveness, meet ever-increasing energy demands, and limit the changes to our atmosphere caused by the burning of fossil fuels. Key to advancing the necessary innovations is an understanding of the vital role of the public sector. Government support has been crucial for transforming lower-carbon energy technologies, ranging from solar power to biofuels to efficient gas turbines, into fundamental components of a cleaner U.S. energy sector. But the government role has been highly complex, and its contributions have been uneven. 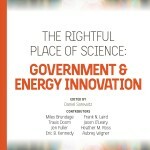 In a series of in-depth case studies, this volume examines the many ways in which government innovation policies and activities, often carried out in close partnerships with the private sector, have helped to create and steer the development and improvement of technologies that underlie the energy infrastructure of the future. In recent years the media, politicians, and activists have popularized the notion that climate change has made disasters worse. But what does the science actually say? Roger Pielke Jr., professor in the Environmental Studies Program at the University of Colorado, takes a close look at the work of the Intergovernmental Panel on Climate Change, the underlying scientific research, and the data to give you the latest science on disasters and climate change. What he finds may surprise you and raise questions about the role of science in political debates. Creative nonfiction—the fastest-growing writing genre in the publishing world—means true stories well told, communicating ideas and information in an accessible narrative form to enlighten general readers. This purpose is becoming increasingly important as scholars of science, technology, and innovation policy attempt to connect with and influence a wider, more inclusive audience. 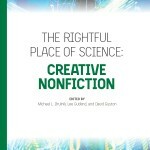 This book is a collection of narrative essays that presents expert knowledge about science, technology, and innovation policy without the use of buzzwords and jargon. The essays in this book are the product of a landmark four-year program supported by the National Science Foundation called Think Write Publish, and the beginning of a worldwide narrative movement that will make a lasting impact on a large and diverse readership. This volume explores citizen science, the movement to reshape the relationship between science and the public. By not only participating in scientific projects but actively helping to decide what research questions are asked and how that research is conducted, ordinary citizens are transforming how science benefits society. 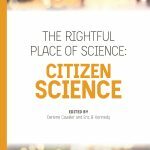 Through vivid chapters that describe the history and theory of citizen science, detailed examples of brilliant citizen science projects, and a look at the movement’s future, Citizen Science is the ideal guide for anyone interested in one of the most important trends in scientific practice. 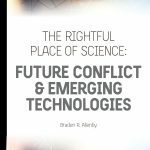 From ASU professor Braden Allenby, a leading analyst of emerging technologies in terms of both their military application and their ethical implications, this book examines how new technologies are transforming military and security strategy, making familiar institutions and traditional approaches obsolete. From Russia’s recent invasion of Ukraine to the “durable disorder” of the new Middle East, from the digital frontier of cyber conflict to the use of autonomous lethal military robots, Future Conflict & Emerging Technologies offers a concise and readable introduction to the trends shaping our geopolitical present and future. There is a robust and growing demand for a more pragmatic approach to the climate challenge. 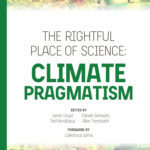 The Rightful Place of Science: Climate Pragmatism brings together powerful ideas for meeting this demand. The starting point of this new approach is a commitment to human dignity and the potential for innovation to drive economic prosperity and protect the lives and livelihoods of billions of people. Driven by pragmatic and inclusive political strategies, this new framework builds on earlier work to focus on energy access, energy innovation, and climate adaptation. Two hundred years after its publication, Mary Shelley’s Frankenstein continues to speak to modern concerns about science, technology, and society. 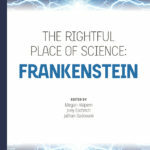 The authors of the essays in The Rightful Place of Science: Frankenstein examine the roots and origins of Shelley’s tragically flawed scientist and his benighted creature. They consider Frankenstein as a parable of creativity and responsibility that can help us better understand our current creative dilemmas. And they show how Shelley’s text foreshadows future technological innovations, and the challenges we anticipate from emerging fields such as synthetic biology and artificial intelligence. Knowledge is every organization’s most important asset. Yet far too few organizations are fully aware and in control of the systems they use to produce, validate, communicate, and apply knowledge. 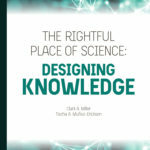 In Designing Knowledge, Clark A. Miller and Tischa A. Muñoz-Erickson examine how knowledge is constructed and used to develop practical insights for improving organizations’ knowledge systems. Miller and Muñoz-Erickson, transdisciplinary scholars of sustainable knowledge system design, provide organizations with the tools they need to design effective knowledge systems for informing critical business, policy, and community decisions. After nearly every hurricane, heatwave, drought, or other extreme weather event, commentators rush to link the disaster losses with climate change. But what does the science say? 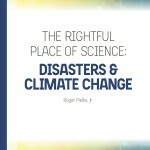 This fully revised second edition of Disasters & Climate Change features updated data, analysis, and peer-reviewed science related to understanding recent weather-related disasters in the United States and around the world. The updated volume also offers an inside look at Roger Pielke Jr.’s most recent experiences on the front lines of the bitter climate debates as he has sought to share consensus scientific understandings with the public and policymakers. He concludes with a proposal for a pragmatic way forward on climate policy—one that recognizes the importance of both evidence and politics. 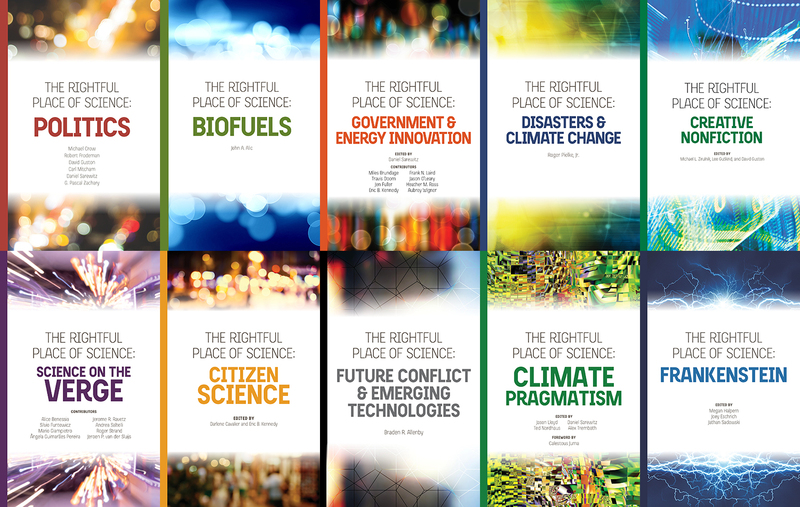 The Rightful Place of Science presents original paperback volumes on topics that reflect the signature interests of CSPO’s intellectual communities. These books are brief, clear, and to-the-point, while at the same time tackling urgent topics across a range of complex techno-scientific subjects. 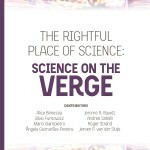 The overall aim is to deliver thought-provoking contributions that explore the complex interactions among science, technology, politics, and society. For more information about the series, including how prospective authors might contribute essays and articles, contact series editor G. Pascal Zachary.